Getting into the game and manipulating the menu is pretty simple, and newcomers were likely considered during the design process, however the menu (which looks like a crossword puzzle) may throw a few people off and make them think they went to far (into a puzzle) without reading (very minor problem). The opening credits are a little long, but they're not obnoxious. Actual menu manipulation works well. What you tap is what you get. While some menu options overlap (across/down crossword entries), players can keep tapping to swap between them. The game is actually really easy to use. You can enter letters by writing them. You can enter letters via an on-screen keyboard. You can't enter more than one letter at a time and you can't speak letters, but neither option is really necessary. They only markdown in this category is the fact that, unlike an actual newspaper, the game doesn't provide access to a complete list of clues to be browsed through. Looking through them one at a time can really slow the process down, and can cause more fickle players to give up sooner. The look of The New York Times Crosswords is rather simple, but what did you expect? There are some nice "screen dressings" to try and make the game more interactive, but the game (like this site) is focused on content and effectiveness, not on prettiness (so I can definitely respect it). Sound in the game is inconsequential. Nothing wrong with it, it just isn't needed. My biggest complaint here is that there is no downloadable Demo for the game. You can't sened someone a puzzle and let them walk away. In puzzle games based on pen-and-paper puzzles (like Sudoku), a simple form (even if the sound is removed and the graphics are stripped to black-and-white) should easily be feasible. The included modes are fantastic, but there could be so much more. I'm going to start out by saying that I enjoyed playing The New York Times Crosswords. It was the first crossword game to come out for the Nintendo DS. 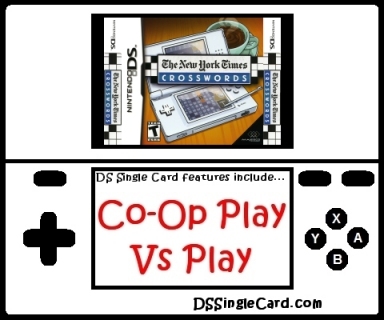 The game was followed by USA Today Crosswords and Nintendo's own Crosswords DS, neither of which have any Single-Card Download content (not even the Crosswords DS demos available in the My Nintendo Channel on the Wii). The game was put together by very knowledgeable programmers that left no glitches to be found. For me, though, there are two things that prevent this title from being one of the best on the market of any category. One is the lack of a demo, that could have had people passing on puzzles to friends to get them addicted. The other is the inability to browse through all of the clues. Now, before you say anything, I understand they can't all be on the screens together or the text would be too small to read. What I would like would be a scrollable list (with a scroll bar on the far right, similar to "tall" web pages in a browser) and the ability to double-tap on a clue to jump to that entry. Like I said at the beginning, though, is that I do like what IS in the game, and the game will come out and "play" again. Include a downloadable Demo containing a crossword puzzle (selectable from the entire collection or limited to a specific one). Allow players to scroll through a list of clues and quick-jump to one by tapping on it. Let players enter letters by voice command. Permit players to enters multiple letters (a whole word) at a time. Click here to return to the DSSingleCard.com The New York Times Crosswords profile.